CharkBait! Internet Sportfishing The CharkBoards! Forums CharkBait Forum CharkBoard Chat Go Ducks! For the past three or four years we've been a bit like the Peabody Hotel in Nashville. A very nice couple of mallards visit us each spring. Hang out at the shop, eat chips or whatever we have handy, drink water from....my freaking coffee cup...thanks Leeana! Usually we'll see a few peepers in a month or so, no telling what happens to those little ones. Nice to see 'em back. 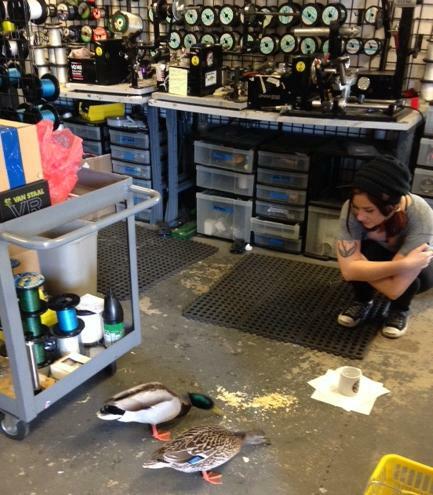 Ah, if you happen to visit our Huntington Beach shop, please don't speak too loudly, and watch where you step... We may be a bit backed up spooling and rigging this week...lost some space to the quackers feeding station. Quick Reply to: Go Ducks!